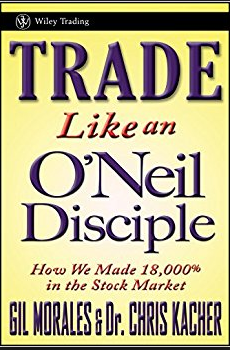 This book was written by two portfolio managers who worked for William O’Neill and as such are practitioners of the William O’Neill investment philosophy which we as an organisation have written extensively about. Our own investment philosophy is an adaptation of the William O’Neill investment process. As the authors observe, ‘while most investors do not hesitate to dabble in the markets, they would rarely dabble in medical or legal practice, or even in playing professional baseball.’ Jesse Livermore famously responded to a question, ‘how can I make some quick money in the markets’, by asking the question, ‘How can I make some quick money in law or surgery!’ The introductory chapter of this book essentially makes the salient point that investing is a full time and time consuming pursuit and should be viewed as such. The basic investment philosophy which you would have heard us talk about at our investor presentations is that is it better to average up than to average down. Put another way by the authors, ‘it is foolhardy to make a second trade, if your first trade shows a loss…..never average losses’. The second basic investment philosophy is that a stop loss policy on all stocks needs to be implemented as huge losses in the stock market can be debilitating. Stop losses prevent this situation arising. Cadence Capital has a similar investment philosophy in relation to losses. William O’Neill comments on this as follows; ‘The whole secret to winning big in the stock market is not to be right all the time, but to lose the least possible when you are wrong.’ In addition, the system of pyramiding into strongly acting positions while weeding out weaker ones generally gets an investor concentrated in the right stocks during a bull market cycle’. One chapter of this book is devoted to ‘patterns and humans’ and a quote that resonates from this chapter is; ‘I absolutely believe that price movement patterns are being repeated. They are recurring patterns that appear over and over, with slight variations. This is because markets are driven by humans – and human nature never changes’. Chapter 2 focusses on the interplay between technical and fundamental research which is something our investors ask us about regularly. The authors go into this in some detail with one of the most interesting quotes being; ‘Buy based on both fundamental and technical analysis, but sell purely on technical analysis’. Whilst this is hard for many fundamental analysts to accept, we would argue that the share price is already starting to adjust for some poor piece of fundamental information that the market is only just starting to process. Another great matter of fact quote form this book is that, ‘One enjoys intellectualizing about the market but crosses the line and starts trying to predict where the market is going.’ I think this is true of all of us at different times in the market and is worth reminding ourselves of from time to time. This brief review and a smattering of quotes cannot do this book justice and I think this book is compulsory reading. The other great thing about this book is that is has a list of Dr. K’s Top 50 Wall Street Books. Many of the books on this list also appear in our list of 52 Books you should read before buying your next stock. There is no doubt that reading these books is a great help in becoming a better investor.